Since leaving his place of employment last July, hubby has been involved in a number of projects. For awhile, he was very enthusiastic about making biodiesel. He was thinking he might gather waste vegetable oil and turn it into fuel. He has a friend, M.P., whose mother lives a few miles down the road. 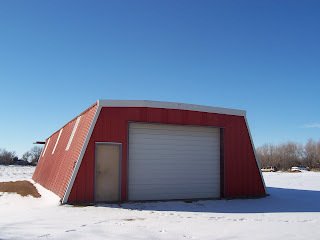 On her property is this building. 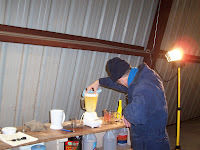 Hubby talked to M.P., who agreed to lease him some space in the building for bench testing of the biodiesel. Hubby found some grease and set up a lab. He spent quite a bit of time there frolicking with the grease. Then, he hit a few snags and needed to figure out how to deal with them, so he was away from the lab for awhile. One day, he got a call from M.P., whose mother had called and suggested someone get down to the lab right away. Hubby ran out of the house and made a speedy trip to see what was up. When he arrived at the lab, he was baffled to see numerous vehicles belonging to law enforcement officials parked there. With extreme trepidation, he exited his vehicle and approached the door. The door swung open. Seven or eight of Enid's finest turned to see hubby's form silhouetted in the door frame. An awkward pause ensued and then hubby asked, "May I help you?" P.O. "What have you got going on here?" Hubby: "I'm bench testing for biodiesel." P.O. "Yeah, we had pretty much figured that out. We got a report that it was a meth lab, but meth makers don't usually label their samples." Hubby: "Why did someone think there was a meth lab here?" Sheepish guy standing off to the side who leases space from M.P. to store his boat in the building: "Um, I guess that's my fault. I came in to check my boat and thought it was a meth lab and called the police." After which everyone cleared out and hubby came home, where my daughter and I were anxiously waiting to know why he had left in a panic saying "I have to get to the lab!" So he told us the whole story, said he just about had a heart attack, and we laughed and made the appropriate jokes. Ah, good times. Too funny!!! I really enjoyed this one---wish I could've been there to see the look on Randy's face!!! I think Randy should take my suggestion and build instant tornado shelters. Crawling into bath tubs does not seem to be the answer. lois - I was thinking later I should've taken a picture, because I knew there would be a blog post about THIS! bill - Yeah, our bathtub is right next to a big window, so we are going to be crouching in the laundry room on top of the washer. We'll probably take the litter box out. The thought of cat . . . stuff . . flying around, is quite unpleasant. 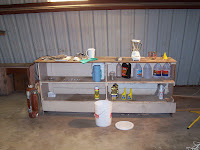 I can totally see how someone would mistake this for a meth lab. Those kinds of pole barns are exactly the kinds of places where people do that. And the drain cleaner and little measuring spoons don't help either. Now, how to get his name off the terrorist watch list. Hmmm. h-man - I know! It doesn't help that someone gets busted for a meth lab about once a week around here. And to think my biggest worry was that he would come to be known as "that crazy guy who takes used grease from dumpsters behind restaurants."